Something to note about thunderstorms in the Assiniboine area; they are impressively loud. With the area around Magog Lake being a large bowl, sound is focused and echoes loudly whenever there is a thunder clap. It makes for some serious booms at times and reminds you just how much power a storm can generate. Our objective on this day was to do the Nub Peak hike. 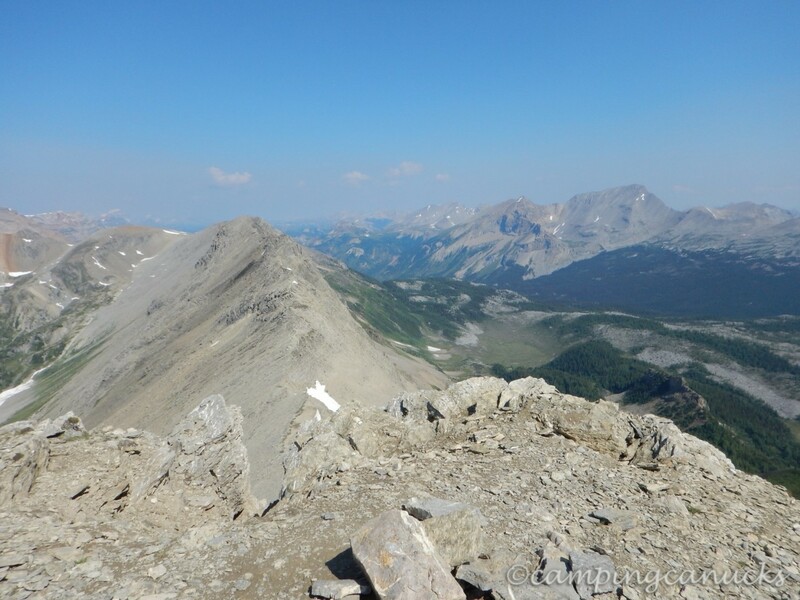 It’s a somewhat short hike to a series of nearby peaks, with a harder, steeper section that goes to the top of Nub Peak for those of us looking for a little challenge. Most people stop at the shorter peak called the Nublet, which also offers some great views and a nice place to have lunch but we were determined to make it to the top. The morning was cool and humid due to the rain the previous night as we got underway, but once again, we expected it to be a warm day so we were up early to beat the heat and the crowds. The trail to the Nub largely winds through the forest for the first few kilometers until you reach the alpine and is greeted with amazing views. Even in the forest, though, we were greeted with views of two of the most colourful mountain lakes you can imagine. And being morning, the lakes were still very calm, which made for some wonderful reflections of the nearby peaks. 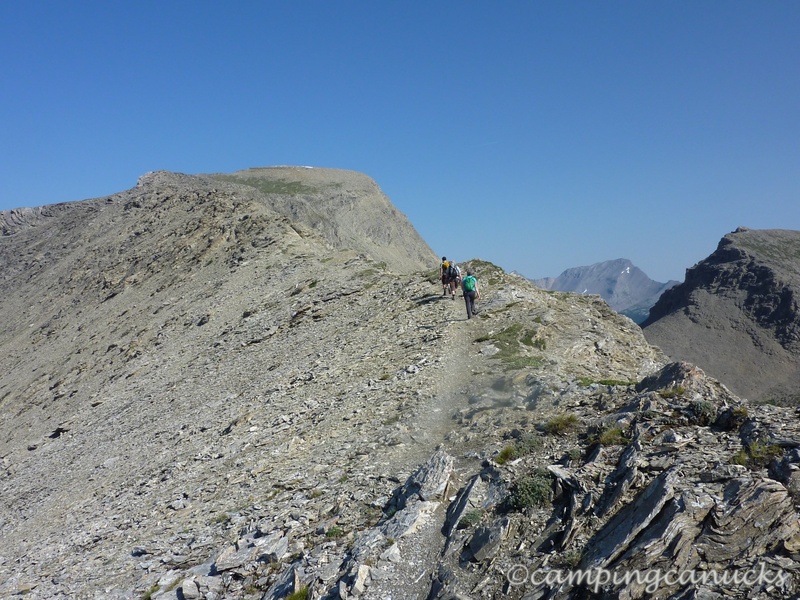 After passing by Cerulean Lake, we began a bit of a steep climb for the next kilometer or so and came out of the trees on the lower part of the Nublet. 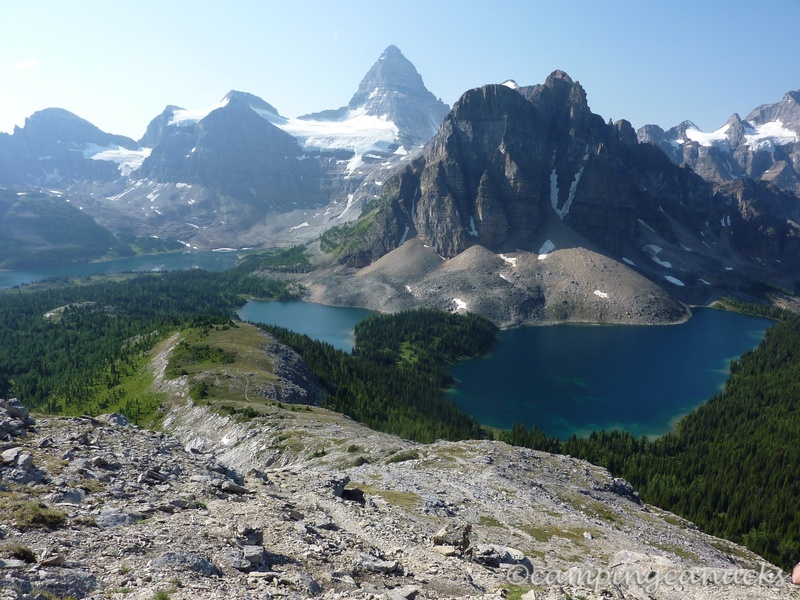 This is where the first big views of Assiniboine and its nearby lakes really start to show. 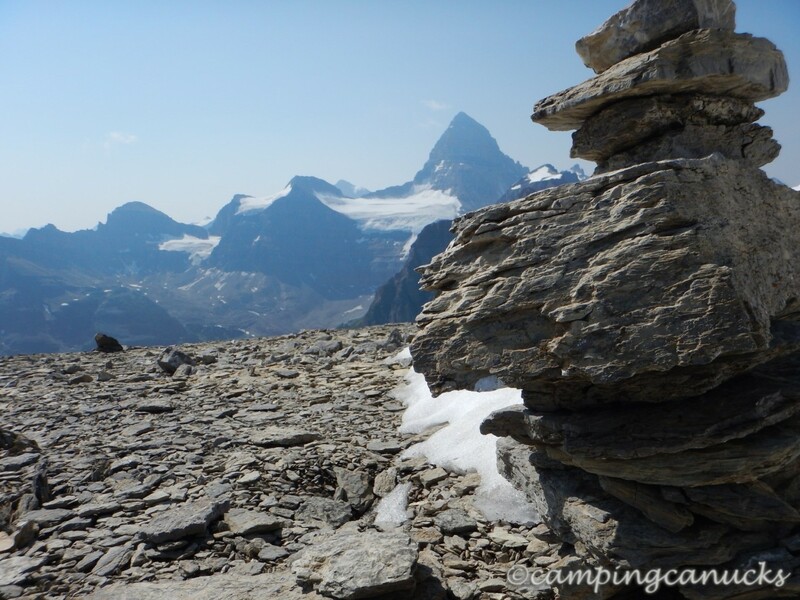 The view here is worth the trip but for the those who want to do some scrambling, the Nublet awaits. Further up after a steep but short scramble, we reached the Nublet itself. 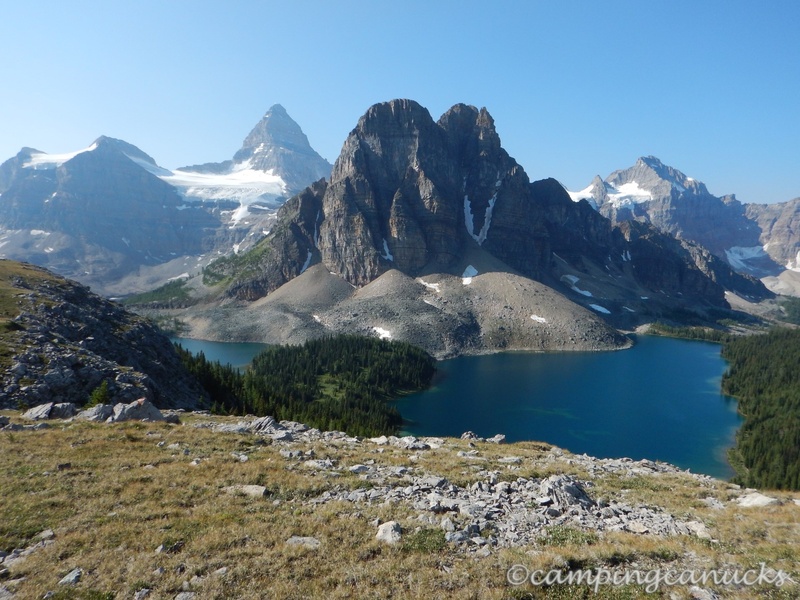 This is where most people stop as the views are outstanding and there is a large area to just sit and relax and enjoy the unimpeded views of Mount Assiniboine and three lakes; Magog Lake, Sunburst Lake, and Cerulean Lake. Unfortunately for us, there was smoke in the air which was affecting our views of the surrounding peaks. 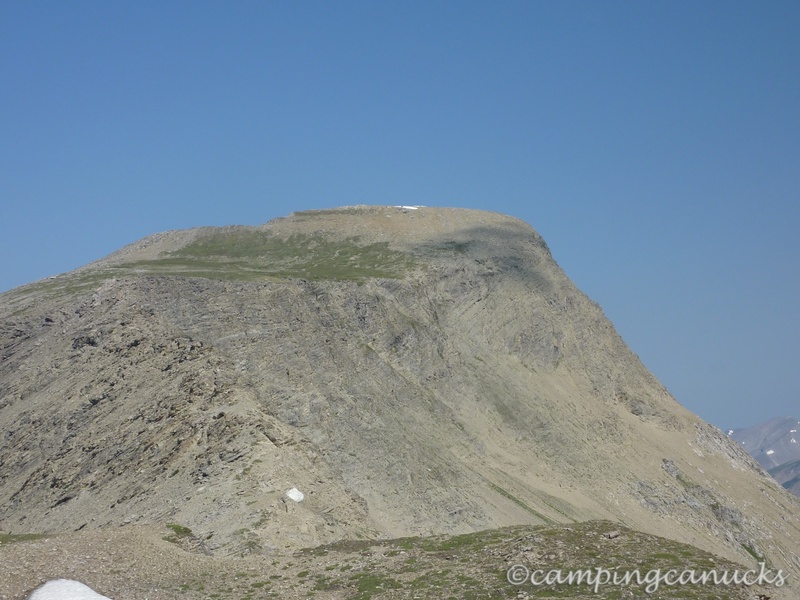 The next part of this hike for those who feel a bit bolder is Nub Peak. This isn’t a really long section of the trail but it does require some scrambling over some slippery talus and rock slopes. The scramble at this section is about 1/2 kilometer long and while it’s not very difficult, we did have to do some backtracking as in places the trail was a bit vague. Once clear of the loose rock, though, we reached the lower part of Nub Peak. This section is just a grassy and rocky ascent that continues on for another 1/2 kilometer, steadily climbing to the top. We were greeted by a large pile of snow as we reached the top. The usual windbreak that you find on many peaks was partially buried in the snow but the cairn at the highest point was mostly uncovered. It is from here that you truly get a 360 degree view of the area. It’s too bad it was as smoky as it was because we would imagine that on a nice, clear day, you would be able to see a long way out over the mountains. We wandered on the top for a bit and as there was no wind, it was a great place to just sit and relax for a while. Much of the top was pretty safe but there were some vertigo inducing cliffs on the north face of the peak. We tried to get some photos of them but without any points of reference, they just don’t look like much. You need to stand at the edge (or crawl like I did) to truly understand the feeling. Eventually we headed back down and quickly descended as we made our way back to camp. At this point, there were quite a few people so we were glad we beat the crowds and got to enjoy Nub Peak by ourselves. We arrived back at camp near lunch and chose to take advantage of an extra hot meal we had brought along. After fueling up we decided to head for Wonder Pass since at this point it was still early in the afternoon. 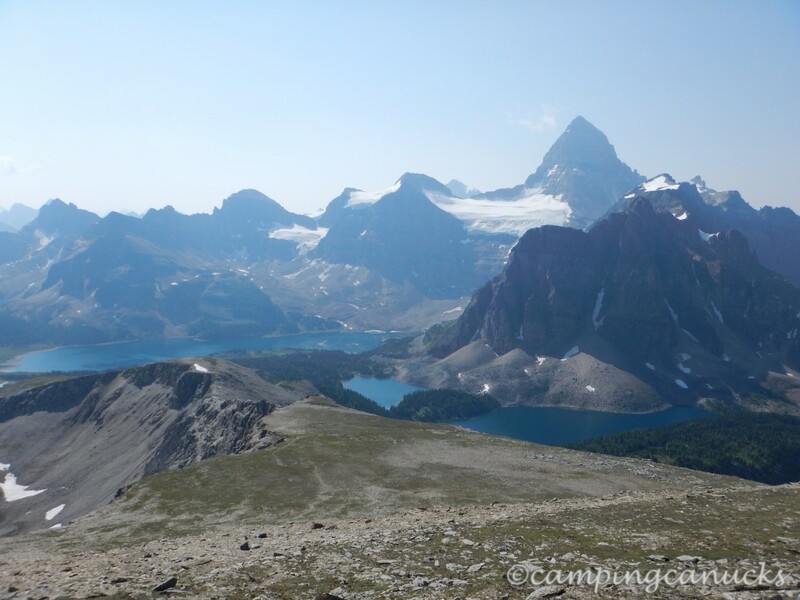 The trail to Wonder Pass goes right by Assiniboine Lodge and from the Magog camp, there are two trails that head in the direction. 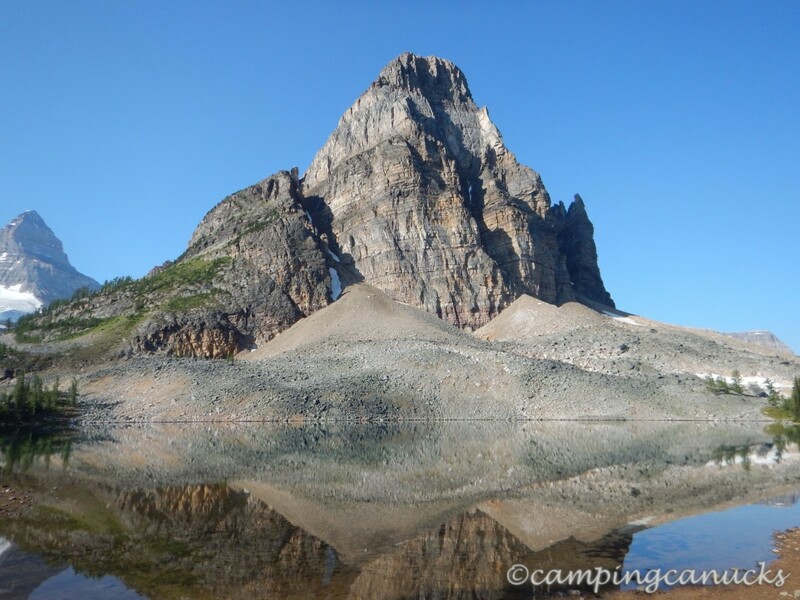 We called them the low trail and the high trail with the low trail being the more scenic route as it came out of the trees and followed the shoreline of Magog Lake. We followed the low trail to the lodge. However, we did not make it that far. 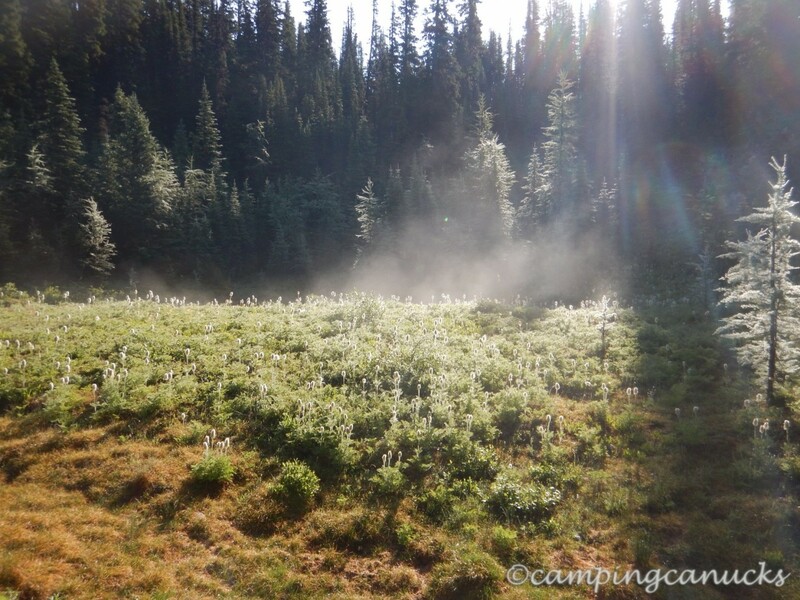 About a kilometer down the trail, we walked into the meadows and found ourselves about 50 meters from a mama grizzly and her two cubs! That stopped us in a hurry and we quickly started to back up while we grabbed our bear spray. It didn’t seem that she had even seen us so I yelled at this point to get her attention so that she wasn’t surprised. Her cubs looked at us and then ran off across the meadow but the mama bear just kept doing what she was doing. 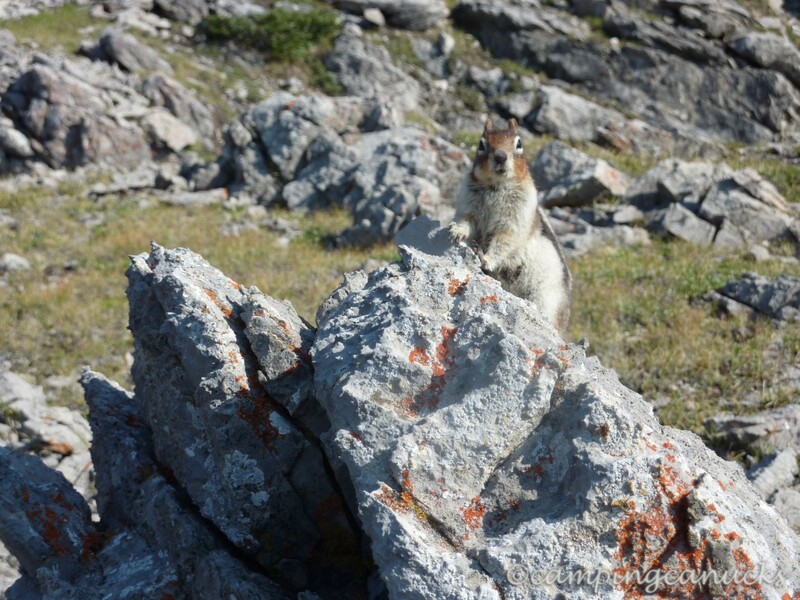 She appeared to start to charge towards us at one point but then stood up on her hind legs looking in another direction. After that, she started darting around the meadow and we realized she was chasing ground squirrels. It was kind of amusing as she sort of looked like a cat hunting a mouse. A very large cat. We figured it was high time to get out of there and made our way back to camp. Along the way, we met a large group of people who had spotted the cubs and had then moved along the trail concerned about where the mother was as they didn’t see her. In any case, no one was hurt and we figured the bears were somewhat used to having people around as Assiniboine can be quite a busy place. We also got to enjoy our first rain and storm free day. The camp was very quiet that evening as well and we enjoyed sitting in the food shelter playing games and cards. This was a first for the trip since each night we had more or less grabbed a table, cooked dinner, and then headed to our tents to allow others the chance to cook. This was our last night at Assiniboine before we flew out the next day. We had learned that our flight was going to be delayed by an hour so we decided we would drop our packs at the lodge the next day and head for Wonder Pass. With no rain that evening, we rolled back the fly and were able to view a star filled sky, clear of the moon and any other sort of light pollution. The night sky is truly amazing at these altitudes in conditions like that.